WITH the spread of education, growth of photographic establishments, and the import of albums, families started creating visual records, taking care to have all the rites of passage represented. The five children of R.C. Dutt as well as his brother’s family maintained albums and regularly exchanged cartes-de-visite — and, if the occasion merited, cabinet-size photographs — with relatives and friends. School-going children, boys in fancy dress, young women, housewives, and the professional were carefully placed within the leaves of expensive albums. Often, a little note to the recipient was written at the back of the carte-de-visite. 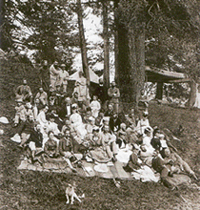 The extended Tagore family was a much-photographed community, with images recording different life stages of most members. These photographs introduce us to a number of amazing women from this family, some more Anglicised than others. These document sartorial innovations, portray the older generation in traditional clothing, as well as provide in microcosm an insight into the evolving status of the upper-class bhadramahila. Another example of success through home-based education, Swarnakumari, fifth daughter of Debendranath Tagore, went on to be a writer of some repute, the first Bengali woman novelist. 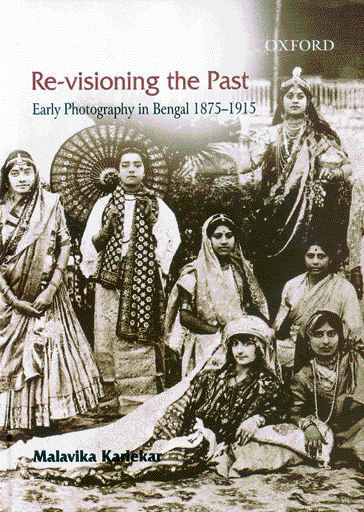 She also edited the family journal Bharati. The photograph is probably taken in the 1880s and she is wearing a high-necked blouse, Parsi-border sari and brooches. Protibha Debi has obviously been photographed before an important social occasion. She is wearing a gold-worked sari, velvet blouse also with gold work, has an elaborate coiffure, long earrings and holds a fan in her hand. The fan and earrings of this kind were much in fashion. Not uncommonly, accoutrements such as the fan and straw hat, indicative of the individual’s social position (often reflecting styles used by those similarly placed in Britain) and used on special occasions, were strategically placed within the frame. Indumati was the only Tagore woman of that generation to wear a gown as her usual dress. 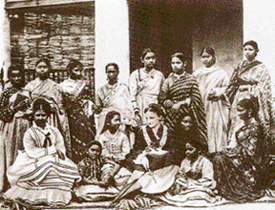 Wife of Dr Nityananda Chattopadhyay, Indumati lived in Madras. To be photographed reading and then with a racquets in hand were to convey to the viewer that Indumati was an educated woman, interested in sports and a life outside the home. Well-known film actress Devika Rani was her granddaughter. Perhaps one of the most outstanding and enterprising woman of the family, Sarala was a student of Bethune School and had wanted to study in Physics in college, ‘just like the boys in the family.’ As this was not a subject taught in Bethune College, special arrangements were made for her to attend class at the Science Association. She was not only the girl in the class, but also was accompanied by two ‘bodyguards’ — her brother and a cousin — on either side! Her autobiography does not make clear in what subject she did her BA — but apparently she switched to the arts stream. Sarala worked for the family magazine Bharati, went to teach at a school in Mysore, and on her return, was active in organising training in the martial arts for young men. She was married at the relatively late age of 33 to Punjabi nationalist Rambhuj Chaudhuri and went to live in north India. The direct influence of western sartorial styles was very evident among the more Anglicized sections of bhadra samaj. Wife of barrister Monomohan Ghose — who had been schooled in England and involved with Dwarakanath Ganguly in the establishment of the Hindu Mahila Vidyalaya — Swarnalata wore western dress with the active encouragement of her husband. She rode as well as accompanied Monomohan to mixed social gatherings, soirees, and shikars. Others preferred to combine western-style blouses with their saris and wore shoes, stockings, and veils. Till well into their teens, Sarala Dutt and her sisters wore dresses. In the studio composition taken at Bourne & Shepherd, Calcutta, in 1893, the year before her marriage, Sarala is wearing a Parsi-border sari with a velvet blouse. There are striking similarities in the pose, position of the hands, arms and blouses between this studio portrait and that of the Englishwoman. Though Sarala is not wearing a dress, her sari pallav is pulled fairly tightly, accentuating her waist as would be the case with a fitted gown, and is fastened with a brooch on her left shoulder. Pins, brooches, and fans became favourite accoutrements introduced by Brahmo women.